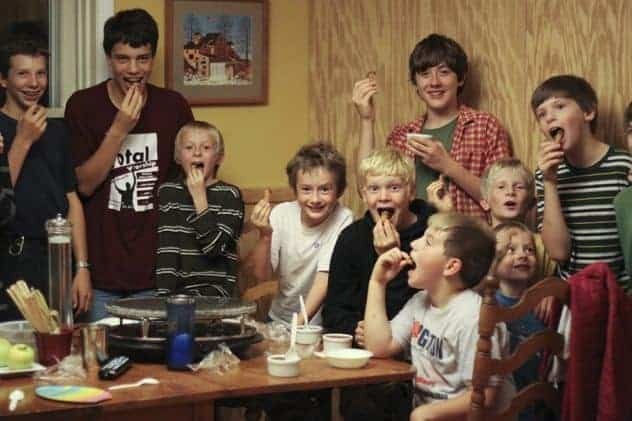 If I could tell you one thing about hosting a sleepover for twelve boys, it’s that “sleepover” is a highly inaccurate way to describe the event. 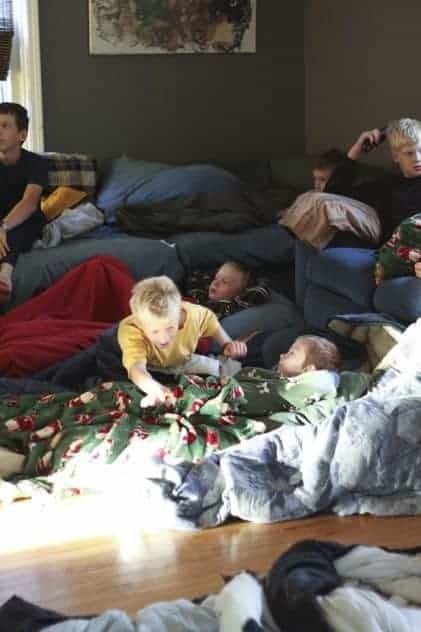 You’d do better to call it a Zombie Apocalypse-over or maybe a Nerf gun war-over, or even a Doctor Who over, but sleepover? Most definitely not. But I’m getting ahead of myself. 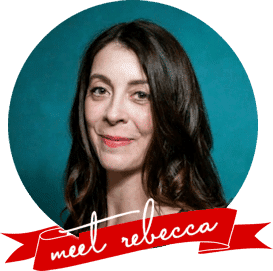 When I was selected by the Foodbuzz Tastemaker Program and Electrolux to host a sleepover event, there was one clear direction to go with it and it requires a word (or several) of explanation. There’s one big thing you all need to know about me that you might not know already. 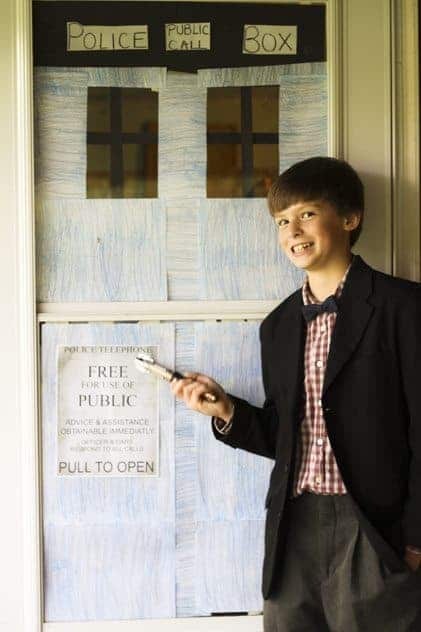 *This may lead you to wonder what the connection is between Amish country dwellers and Whovians. We’re theorizing that it’s something to do with the crack in the universe, Time And Relative Dimensions in Space, or the number seven. Or maybe it’s just the Daleks hiding in Amish barns. All this to say that it was clearly going to be a Doctor Who sleepover and boy was it going to be fun. We decorated the front door as the Tardis (because it’s bigger on the inside.) We invited the most Doctor Who obsessed friends the kids have, which just happened to be seven boys. As I said above, that brought our normal total of five boys up to a whopping twelve. If you’ve ever fed teens and pre-teens you’re probably feeling a little panicky now. Never fear. I have a secret weapon and I’m going to share it with you. Raclette is a specialty of France, Switzerland and Germany. It is a hot stone or metal grill atop a rack that sits in the center of the table. Tasty treats like small cooked potatoes in their jackets, bread, onions, peppers, mushrooms, ham, sausages and whatnot heat on the upper portion while individual trays of cheese (traditionally Raclette cheese, but you can use whatever floats your boat) melt underneath. When the top cheese is melted and bubbly, a scraper is used to move the melted cheese over top-heated goodies on your plate. Can you think of anything tastier? Melted bubbly cheese over hot potatoes or bread? With Centauran potatoes, “The Rebel Flesh” fondue (raclette is an old form of fondue), and other Whovian themed noshables, there were twelve very happy boys here last night.This brings me to a very important point. Raclette is the perfect (and I say that advisedly, I understand what perfect means) way to entertain kids (of all ages, from four to one-hundred-and-four) at a sleepover. The children (Sorry boys. I know some of you are teens, but you will always be children to me. Even when you’re old. This is a universal truth.) were at the raclette grill -and therefore the dinner table- for one hour and forty five minutes. You read that right. Twelve boys ages five through fourteen sat at the table with no one wrestling for nearly two hours. If you have boys, you may be gaping at me, but I speak the truth. All told, the food to feed the whole crew came to a cost of about twenty dollars and took me less than thirty minutes to prepare. That made it an easy, fun party that was a bargain to boot. So, how do you make your own raclette dinner? Serve a big bowl of small potatoes. Small potatoes that are pre-cooked (like these) heat up nicely on the raclette cook-top. Potatoes plus cheese equals big taste. Lay out a variety of pre-cut vegetables such as onions, green and/or hot peppers, mushrooms, and assorted olives. It doesn’t have to be a lot of each, but variety keeps it fun. Use deli meats or pre-cooked sausages or shrimp for protein. Deli ham and pepperoni prove to be the most popular choices around here. Again, you don’t need huge amounts, it’s the assortment that makes it exciting. Don’t worry about slicing your cheese ahead of time. Lay out a couple of different types in brick form along with a cheese plane and let your dinner guests choose their favourite. This way, the cheese won’t start to sweat and droop before you pop it under the heating element. 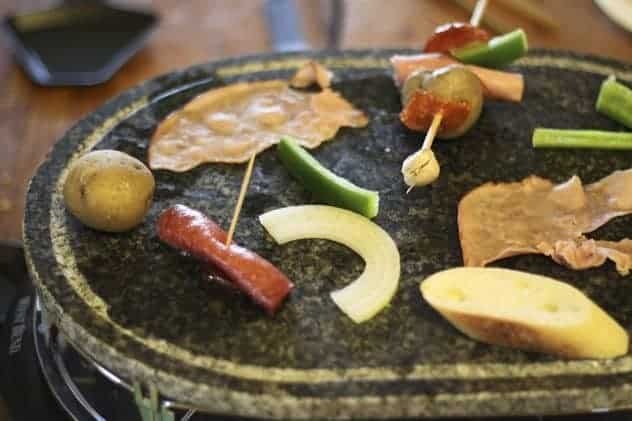 Offer more than one way to cook your food on the hot stone: skewers, tongs, and a spatula should cover all preferences. Serve apple slices with your raclette! Apples help cut through some of the richness of all the melted cheese and salty meat. They act as a palate cleanser. Similarly, serve apple cider or grape juice to the kids at the table and cider, or a crisp white wine or beer to adults. Take your time. Raclette is a time for conversations and companionship; Slow and easy chatting, smiles and laughter are a requirement. With such a dinner as this under their belts, the rest of our Doctor Who party went as swimmingly as the flying fish in the Christmas episode. The Doctor himself made an appearance. Is it just me, or does the Time Lord appear to be getting younger? Hmmm. Keep it simple and don’t micromanage. Have some activities planned in case things stall, but let the kids take the initiative. Creativity abounds in kids and they will, in all likelihood, keep themselves amused better than we ever could. Check your entertainment plans with the other parents in advance by making sure any foods, movies or games you have slated for the evening are okay with them. This will avoid any awkward, “We’re not allowed to eat/watch/do/play that!” moments. The other moms and dads are sure to appreciate your effort. Make certain the other parents know what is required of the children who are attending. Need the kids to bring sleeping bags and pillows and bow ties and sonic screwdrivers? Give that message directly to the parents. Give them autonomy without anarchy. In other words, allow the kids to have fun without letting things degenerate into utter chaos. They’re having a Zombie Apocalypse reenactment and chasing each other with sticks? Fine-o, but be certain no one is actually getting whacked with the sticks. See the difference? You don’t have to stand by with a whistle and handcuffs, just be aware. Make sure you’re not out of coffee, tea, or your other stimulating beverage of choice. Can you imagine coming downstairs at six a.m. to find this scene with the realization that you had no caffeine in the house? This sleepover was sponsored, in part, by the Foodbuzz Tastemakers Program and Electrolux to raise awareness for their Ovarian Cancer Research Fund. They have partnered with Kelly Ripa and Kelly-Confidential.com. When you join Kelly’s Virtual Sleepover, Electrolux will donate $1 to the Ovarian Cancer Research Fund. Not only that, but those who join are automatically entered to win an Electrolux Perfect Steam Washer and Dryer set. Big thanks to my sons and their friends for making our Raclette/Doctor Who party such a great time. Raclette dinners are the perfect prescription for the ailing dinner party. A leisurely meal of melted, bubbly cheese and hot, cooked-to-order meats and vegetables will ensure a good time is had by all. Heat the raclette grill while laying out the meats, vegetables and bread on platters. Pre-slice the cheese, or arrange it on a cutting board with a cheese plane. 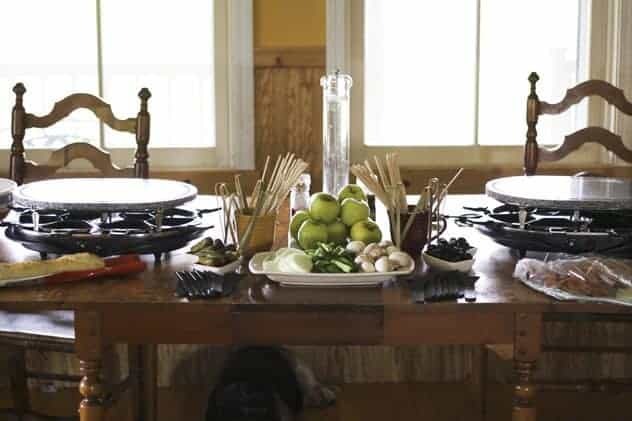 Allow guests to cook their choice of meats and vegetables on the raclette top while melting cheese in the tray underneath. Transfer the hot meats or vegetables to the plates and scrape the melted cheese over them. You need a bumper sticker that says, “My house is more fun than yours.” Or “If your kid runs away, check over at my place.” That picture…of all the boys. Heeee. God bless ya woman! All those boys! I’ve had sleepovers with boys before but not that many! Hope you all caught up on some sleep! Very cool. I will have to learn more about your lovely Raclette too. 1.) 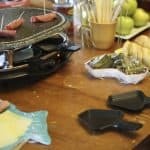 Where did you manage to find a raclette grill in the States? b.) I know you live in Amish country… where did you find raclette cheese? And at a reasonable cost? 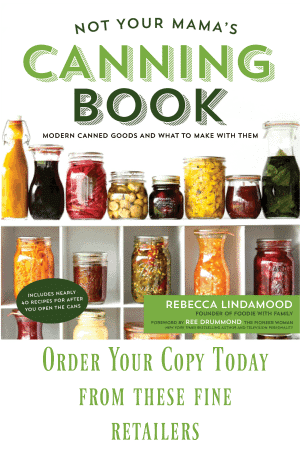 I can find it at my city Whole Foods, but, as you may well know, Whole Foods means Whole Wallet & it is pricey. 75.) Can you get any more awesome? 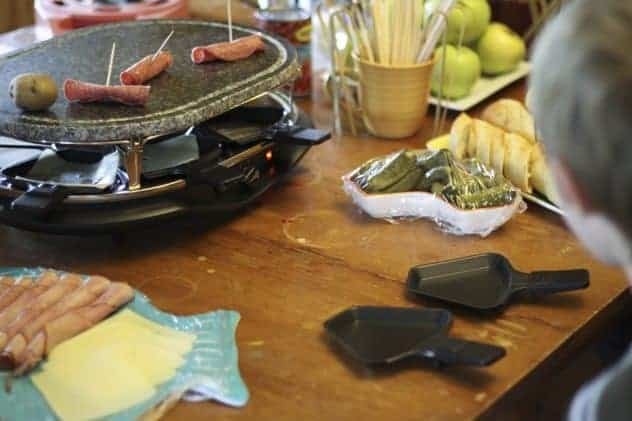 I’m an Indepensent Velata Consultant and we have an awesome Raclette with two cooking surfaces..check out my website. I love Dr. Who and can’t wait to try your theme with my family! Thanks for the tips!